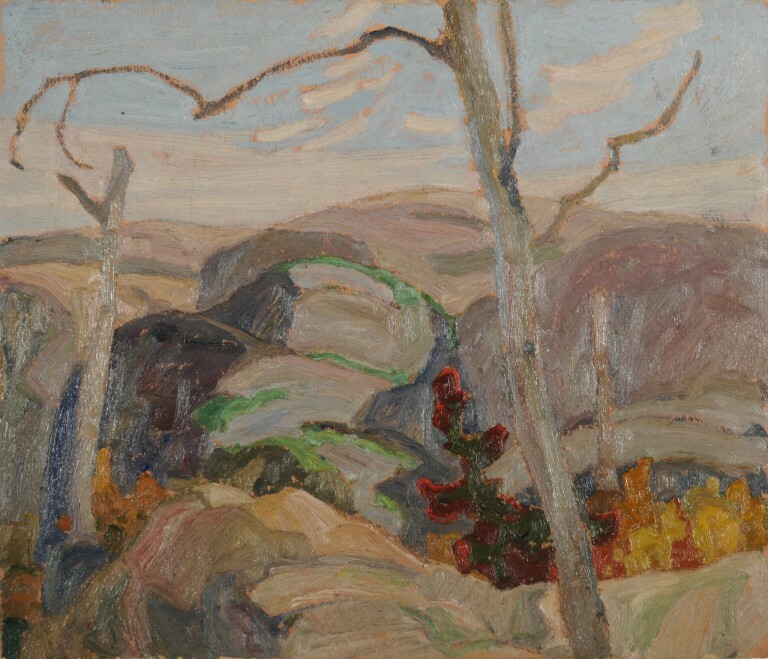 For this undated sketch, Franklin Carmichael chose to work in oil, the favoured medium of his Group of Seven colleagues. Like J.E.H. MacDonald’s sketches of Mongoose Lake in the Museum London collection, this work also finds Carmichael looking for broad areas of colour and form rather than detail. Yet his sensitivity to colour is clearly displayed in the thick areas of paint that combine a complex range of pigments to create dimension and shadow. Carmichael actually preferred working in watercolour, which he felt could “respon[d] to the slightest variation of effect or mood.”1 His watercolours of AlgonquinPark, the La Cloche Hills, and the northern shores of Lake Superior—not to mention his depictions of industrial landscapes and mining towns—confirm his mastery of the medium. Carmichael’s contoured approach to the natural scene in this work may also reflect his extensive experience with commercial design. His career in this industry was longer than any other member of the Group of Seven: beginning as an office boy at Grip, Ltd. in 1911, he later worked for the firms Rous and Mann and, from 1922 and 1932, Sampson-Matthews, where he became head designer. After leaving Sampson-Matthews to lead the Graphic Design and CommercialArtDepartment at the Ontario College of Art, Carmichael continued to produce book illustrations and to pursue his love of the graphic arts through printmaking. 1. quoted in Anne Newlands, Canadian Paintings, Prints and Drawings (Richmond Hill, ON: Firefly Books, 2007), 70.